Product Round-up Compact enough for a bookshelf but punching above their weight compared to a portable radio, mini hi-fis are an audio staple. These items can become the sole sound system for anyone pushed for space in bijou flats, bedsits and student digs or serve as a back-up in bedrooms, kitchens and other places around the home. This part of the market is still fairly conservative. CD playback remains key, while ‘special’ features such as an iPod dock or DAB radio tuner wouldn’t have looked unusual almost a decade ago. USB sockets are increasingly common in these systems but often restricted to playing MP3 files rather than higher quality lossless formats like FLAC. Also, wired or wireless network connections, now essential in a lot of consumer electronics devices, are only slowly making their way into mini systems. With a varied price range, it's not simply you get what you pay as this round-up uncovered some sound offerings at a reasonable sum. This system from the British luxury brand is a modern classic. You can partner the Mini with any suitable speakers or with the Muso pair, which use sturdy metal enclosures. The main unit is equally robust and adorned with a vast array of sockets. There are combined binding post/screw terminals for the speaker outputs (and on the speakers themselves), while a USB port is for MP3/WMA playback, as usual. It lacks a built-in iPod dock but the optional irDock is top-notch and offers control through the system’s user friendly remote. Power output is 2 x 25W. CD playback is where it excels, delivering clean and precise audio quality, although it’s less forgiving with MP3s. The radio (including DAB) features both F-type and Belling-Lee connections and fares well too. 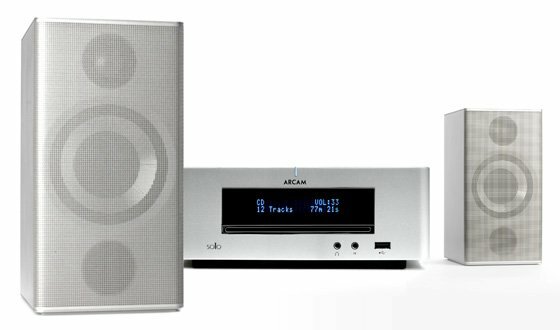 As with the Arcam, this is a classy offering built around the slim metal-cased DR30 receiver. A separate £149 unit (CD30v2) provides disc playback or another option is the £400 NP30 network media player. The separate DD30 iPod dock is supplied in the box. The receiver’s wealth of sockets includes screw/binding post speaker terminals. Power output is 2 x 40W. It lacks a USB port but there is a mini-jack for MP3 players. DAB tuning was problematic at first but fine after recanning. Vocals are powerful and forthright but higher notes could do with more sparkle and the speakers sound boxy at times. Compressed iPod tracks are also somewhat woolly. All in all, it’s a chic but slightly disappointing system.